In 1933, Walter Luff replaced Charles Furness as Transport Manager and set out a five year plan in which there would be many far reaching improvements made to the tramway. He moved almost immediately to rejuvinate a system which had it been left, would have closed like many other similar systems. The trackwork was improved by installing turning loops at Starr Gate, Pleasure Beach and Little Bispham allowing trams to be turned faster and without the need for the driver to change ends, the guard changing the direction of the swingover seats and the trolley pole being turned around. Bypass lines were built at Tower, Talbot Square, Cabin and Bispham to avoid congestion when a tram was changing ends. The Central Drive and Layton lines were closed and replaced with buses. In the case of Central Drive it was too congested and was close to the Promenade and Marton routes anyway whilst Layton was mostly single track with passing places and was uneconomical to operate as patronage was poor (the terminus was at the entrance to a cemetry) and the line would have to be extended a further mile up the road to a new housing development to be profitable. The full Marton Route was relaid to make the entire route double track, eliminating the single track with passing places that existed on part of the route. Walter Luff also took a look at the fleet of trams he had inherited and was not happy, there were a large number of different types of tram running and many of these were antiquated, were fitted with various different types of controllers and electrical equipment and were badly needing replaced, some of the cars in service were original examples from when both original tramways first opened in 1885 and 1898 respectively. He approached English Electric about renewing the fleet and soon a prototype railcoach (200) was delivered to Blackpool. This car was a revelation, it was nothing like anything else that had ever ran on the tramway and was the height of luxury. Passengers even wiped their feet before boarding the tram, it was that popular!!!!! A further 24 of these cars were ordered, they were mostly the same as but slightly longer than the prototype car. They were built, delivered and in service by 1934. A further 20 railcoaches were ordered from English Electric and were delivered and ready for service in 1935. 14 of these railcoaches are still in existance abeit in a different guise. The railcoaches settled down to work on the Promenade Route, Lytham Road Route and North Station Route, later they would also work on the Marton Route beside the VAMBACS. A sample open topped double decker was also ordered in 1934 along with an open topped single decker. The samples of both trams proved very popular so a further 11 open top single deckers called luxury toastracks (now more fondly known as the boats) were ordered as were a further 12 open topped double deckers and 14 enclosed double deckers of the same type. These double deckers would later be known fondly as the balloon car. The Balloons took the place of the Dreadnought Double deckers which operated on the prom at the time. Walter Luff didnt like the Dreadnoughts as he saw them as being antiquated and dangerous, however the Blackpool public did like them and set up a petition for one example to be saved from scrap for future use. Dreadnought 59 was saved and saw use as a works car until restoration became a possibility for the 75th Anniversary celebrations in 1960. In 1936, Lytham St Annes town council, voted to close their tramway, this caused problems for Walter Luff as he had hired tramcars from them for the busy illumination period. Had their tramway remained open Blackpool Corporation Transport had plans to take over the running rights of the Lytham St Annes tramway and make a promenade style reserved track all the way into St Annes and out to Lytham. (If this had happened that section of tramway would probably still have been open today.) With their system having closed and the resulting shortage of trams for the Illumination period, Walter Luff decided to order a further 20 railcoaches to help move the passengers during this period, however designer of the previous order of railcoaches, had moved from English Electric in Preston to Brush in Loughburgh. Thus the subsequent order 20 railcoaches came from Brush. The Brush Railcoaches were similar but were slightly different to the EE railcoaches in everyway due to patent and copyright. The Brush Railcoaches went on to give over 70 years of service and are thought of by many to be some of the most reliable and best trams that the tramway has ever and will ever have. Many of the Brush Cars still in existence today. Two of them (623 and 630) are in service at Museums (but currently on loan back to Blackpool) whilst 621 and 631 are still in use with the heritage fleet and another three (624, 632 and 634) are stored for future use at Blackpool as part of the heritage fleet. The Brush Cars entered service in 1937 and started work on the Lytham Road Route. They originally had air operated doors which were operated by the drivers. Rumour has it that one day a driver opened the door on the wrong side of the tram and a number of items of luggage fell off the platform onto the road and were subsequently crushed by a bus! They were transfered to Bispham Depot to operate the North Station Route in 1940. Following the closure of the North Station route, the Brush Cars were transferred to the main Starr Gate and Fleetwood service which they still operated on right up until the end of the traditional tramway in 2011. In 1939, the delivery of new trams was complete following the arrival from English Electric of 12 Sun Saloon trams which had canvas covered roofs and windows half way up, and reused old controllers and equipment from withdrawn older cars, arrived and were used to operate journeys on the prom. section breakers were shielded to reduce the effects of arcing and to stop it from being visible to enemy aircraft when the trolley passed over dead sections. Bispham Depot, which had been used as a store of summer cars and withdrawn trams was reopened as a running shed,with a number of the trams being either being scrapped or put into external storage at the Thornton Gate sidings. The former depot of the Lytham St Annes tramway was rewired incase the bombing got serious and the dispersal of the fleet was needed. In the event Blackpool escaped relatively unscathed from the bombing which affected large areas of the country. The majority of the fleet were repainted into a mainly dark green livery with small areas of cream (see photo of 700 at the top of the page). The Sun saloons found a new use as troop carriers, they were used to transport troops from the barracks at Squires Gate to the rifle range at Rossall. The Sun Saloons had began to enter service in September 1939 just as war was breaking out. This meant that the role of carrying holidaymakers along the prom never materialised. They quickly found a new use transporting troops to the rifle ranges at Rossall. They were soon christened 'cattle trucks' by the soldiers as they were drafty and uncomfortable. Improvements were carried out to allow the soldiers a bit more comfort, including the fitting of full length windows, partitions between the drivers cab and the saloon and the fitting of a better quality sliding roof. Following several trams being held up by the sun saloons waiting for the soldiers to finish at the rifle range, a siding was built at Rossall to allow the trams to be stored there while waiting for the soldiers to return to take them back to barracks. During 1942 the open topped balloons (numbers 237 - 249) and the open topped and a number of the open balconied standard cars were enclosed making them suitable for all year round use. There was no work for open topped vehicles during the war and there was a shortage of available enclosed double deckers. The former open topped balloons would retain their original slatted seats on the top deck, they received a very thin layer of upholstery, however they weren't very comfortable. These seats would gradually be replaced over the following decades, with 702, being the final Balloon to lose them in 1997. The balloons spent the war years working on the Lytham Road route and on the Promenade. As Blackpool was declared a relatively safe area and was expected to remain largely free from bombing, a large number of Government departments used some of the larger hotels such as the Imperial, Savoy and the Norbreck Hydro. A large number of holiday makers would flood into the town, mainly from nearby cities and towns such as Preston and Blackburn. As a result the tramway was busy especially heading north to Fleetwood on market days, a number of locals staged protests as they were unable to get onto trams as they were often full to capacity by the time they reached Broadwater on the outskirts of Fleetwood. The protestors won as they were eventually given a local service between Broadwater and Fleetwood using Pantograph cars, by then, the oldest single deck trams in the fleet. The local service lived on for a number of years and a special would still be sent to cover between Broadwater and Fleetwood into the 1990's, by this time it was normally a Brush Car or Railcoach that was used. The Pantograph Cars carried the standard 1930's style Green and Cream livery throughout the war whilst all other cars carried the Wartime Livery, then following the war, they received Wartime Livery whilst the other cars were being repainted into a much brighter and colourful green and cream livery. The fleet emerged from the war neglected but intact as most of the trams were reasonably new. The only trams which were scrapped during this era were surplus Toastracks which had been withdrawn in 1939 and the unfortunate Standard 50, which blew over in gale force winds at the Metropole in December 1940 and was so severely damaged that it was deemed to be too expensive to repair and after surrendering all reusable parts was scrapped. Following the war, the system settled back down into a period of normality, with the reopening of Marton Depot and removal of so many of the restrictions which had been in force. The first major post war job that would be tackled in 1948 was the replacement of the worn out track on the Marton route. The track, which was starting to take on a dangerous condition was in urgent need of replacement. Another major development post war was the conversion of the Sun Saloons being converted to railcoach standard and by 1952 were fitted with VAMBAC equipment to allow for smoother, faster and quieter acceleration and braking. Railcoach 208 and Brush 303 were also fitted with VAMBAC equipment with 208's conversion being successful and allowed the tram to be used on the Marton Route with the VAMBACs. However 303's conversion wasn't considered a success as it's air operated doors were too slow to open and close, causing a delay to service. 303 was returned to Bispham depot and as it was non-standard compared to the remainder of the fleet, it was rarely used and would only appear as a last resort. 303 survived until 1963 when it was scrapped in Marton Depot. The introduction of the VAMBACS to Martonsaw the end of timetabled service for the Standard cars, relegating them to specials on the prom and school specials on the Marton Route. The illuminations restarted in 1949 having been postponed during the war and to celebrate, all railcoaches and boats had strings of lights strung from their trolley towers. 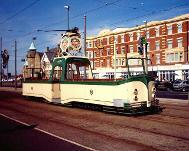 In 1953 the Coronation tram cars came into service, and became the most luxurious tramcars ever built for Blackpool. Despite being some of the most popular trams in the history of the tramway, it was a different story behind the scenes. The trams originally were fitted with steel paneling, making them too heavy, therefore they had to be re paneled using lighter aluminum panels. The roof windows had to be paneled over as they leaked when it rained, indeed when 304 was originally delivered it is said that the roof windows were leaking before it left the lorry delivering it to Blackpool. exception of 324 (660) , which was kept for special occasions, All others were withdrawn with 22 of them scrapped by 1976, whilst a further 2 were sold (both later returning to Blackpool). The crippling loans and cost to run these trams almost bankrupted the Transport Department. Three examples of the Coronation Cars survive today with two now being in service in Blackpool and the third stored for future restoration. 1958 saw the introduction of the Twin Car, The first set was a combination of two series two railcoaches (276+275)which were refurbished and their traditional pointed front ends were removed and they were given flat fronts instead, 275 became a trailer for a time. The twin Cars are a high capacity trailer set which can carry 120 people. These trams were built from 10 series 2 railcoaches (272 - 281) and 10 trailers (T1 - T10) built by Metro Cammell between 1960 and 1962, the motors and trailers on 7 sets (671+681 - 677+687)were permanently coupled in the early 1970's with control equipment being situated on the outside ends of the motor coaches and trailers, the remaining 3 trailers (688 - 690)were withdrawn and following only 12 years of service, were scrapped, whilst the 3 motor coaches (678 - 680)continued to run as ordinary railcoaches. 2 Twin car sets still in use as part of the heritage fleet (672+682 and 675+685) whilst 679 is being restorted as a series 2 railcoach and 680 is restored to 1990's condition and in use with the heritage fleet. 1958 also saw double deckers running to Fleetwood and to North Station for the first time, following the laying of check rail between Cleveleys and Fleetwood. Around this time, plans were afoot for the celebrations of the tramways 75th birthday. They looked at some of their old works trams and decided to convert them back to their original form, this included the restoration Conduit Car 4 (which was disguised as no1, the first ever car), Blackpool and Fleetwood 2, Fleetwood box 40 and Dreadnought 59. That same year it was also announced that the Squires Gate route (Lytham Road) which was in dire need of track relaying at the time would close in October 1961 with buses replacing trams between Squires Gate and Manchester Square. The North Station Route was cut back to outside the Odeon Cinema on Dickson Road and a Trolley Reverser was fitted at the terminus. 1961 also saw the end for the Pantograph Cars on the North Station Route when displaced railcoaches from the Squires Gate route took over from them. The closure of the Squires Gate route also meant that the circular tours, which had only been reintroduced in 1957, and the service from Marton which travelled along Station Road came to an end. The balloon cars lost their timetabled duties to Squires Gate and were now confined to promenade, Fleetwood market and also took over school specials on the Marton Route. This move saw the drastic reduction in the number of Standard Cars used on Specials as the Balloons took over many of their duties, leaving only 6 standards (40, 48, 147, 158, 159 and 160) remaining during 1962. The closure of this route meant that a number of trams became surplus to requirements, all but one of the Marton VAMBACs and a number of series 1 Railcoaches were scrapped. However not all trams that were withdrawn were scrapped, some went to museums for restoration, some found use as works trams and some were rebuilt into illuminated trams. The elderly fleet of illuminated trams were all reaching the end of their useful lives and were practically live when it rained. The new fleet built between 1960 and 1965 consisted of a paddle steamer - The Blackpool Belle, The Rocket, the Western Train, the Hovertram and the Warship. All these trams made their debut in the early 60's and with the exception of the Blackpool Belle which was withdrawn and sold to America in the 70's, gave 30 years service until the late 90's early 2000's. The depot at Marton remained in use for a time until 1963 however when Blundell Street reopened to trams and all cars remaining at Marton that were to be kept were either transfered to Rigby Road, Blundell Street or Bispham Depot. The track and overhead wires remained in place as far as Marton Depot for a few months after the Depot was closed, this cause alot of intrigue at the time, however it was later revealed that this was to allow the Western train to travel up the line carrying officials and guests for the opening of the ABC Cinema in Church Street in 1963. In October 1963 it was realised that 2 routes to Fleetwood werent needed anymore as passenger numbers had fallen and the North Station Route was closed as far as Gynn Square along with Bispham Depot leaving the Promenade route by its self. With these routes gone there was not the same need for as many trams so a number of older trams were scrapped this included most of the pantograph cars, which last ran at Easter 1961, standard cars, the remaining first series railcoaches with the exception of numbers 220, 221 and 224 of them and all but 1 Marton Vambac. as well a few non standard trams, such as Brush Car 303 which was fitted with VAMBAC equipment. Some sources have contained a remarkable story from 1963, the Marton and Lytham Road Routes had been closed in the 2 previous years and the North station route was doomed to follow. One day in September, Railcoach 201 was on the Fleetwood - North Station route, approaching Bispham the tram was stopped and the crew and passengers were transferred over to Brush Car 300. 300 continued on to North Station whilst 201 crossed over to the northbound track and was driven to Thornton Gate where it was subsequently scrapped the same day!!!!!! After the closure of the North Station Route in October 1963, most of the tramway closed for the winter and was replaced by buses. The only section of the Tramway that remained open was the Cleveleys to Fleetwood section.